Welcome to the Friends of the Meetinghouse at First Parish. A vital center for community and civic life and home to the thriving First Parish Congregational Church, the Meetinghouse has been the center of life in this area for 250 years and continues to be a treasured town and regional landmark. The Friends is an IRS-approved 501(c)(3) nonprofit organization with a singular mission. of the 1769 Meetinghouse in East Derry, New Hampshire. Read below about the preservation work underway, how much it will cost, and ways in which you can help. Or jump in to make a donation through any of the programs we offer. Make a statement that will become part of the Meetinghouse. Honor someone in our future Welcome Courtyard. 1824 — The meetinghouse was split, one end dragged, and the middle filled in to expand th church by 22'. Read about the long community service and many changes to the Meetinghouse, and the projects underway to preserve it. 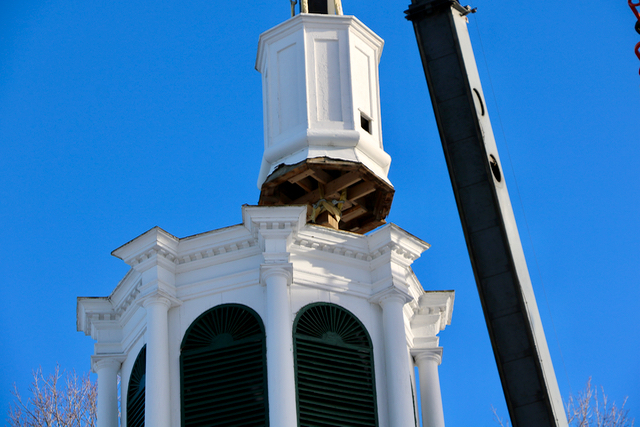 The Upper Lantern is removed in January 2016. Thanks to the many individuals, families, and businesses who have made possible the great preservation progress we've made so far..
donations of time, materials, or any amount of cash are always welcome. Learn how you can make cash or materials donations, or how you can join the team and help with the fundraising effort.